The ARRL will welcome NASA Astronaut Lee Morin, KF5DDB, as its special guest at its 2012 National Convention, held October 12-14 in Santa Clara, California. NASA Astronaut Lee Morin, KF5DDB, will be a special guest at the 2012 ARRL National Convention at Pacificon -- held October 12-14 -- in Santa Clara, California. 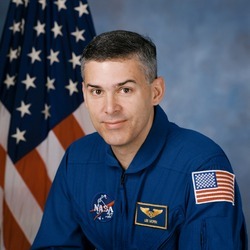 Morin, an ARRL member, served as a Mission Specialist on Atlantis for STS-110 that launched in April 2002. During this 13th shuttle mission to the International Space Station, he performed two extra-vehicular activities (EVAs) -- also known as spacewalks -- the first time that the station's robotic arm was used to maneuver spacewalkers around the station. Pacificon attendees will have the chance to meet and greet Morin in the ARRL exhibit area. He will also present a forum at Pacificon and will be the speaker at Saturday night's banquet where he will share his experiences about spaceflight and his interests in Amateur Radio. Read more here. Are you ready to respond to a local communications emergency? How about within your area, state or beyond? The ARRL Simulated Emergency Test (SET) -- an exercise that enables you and your local, District and Section leaders to test equipment, modes, operating skills and emergency deployment plans to see if everything is in place and ready for an actual emergency event -- is October 6-7. The SET is one of the premier events of the year that invites the Amateur Radio Emergency Service, the National Traffic System, the Radio Amateur Civil Emergency Service, SKYWARN, members of the ARRL Field Organization and other groups to work in concert together to practice and prepare. Read more here. After spending 125 days in space, NASA Flight Engineer Joe Acaba, KE5DAR, Expedition 32 Commander Gennady Padalka, RN3DT, and Flight Engineer Sergei Revin, RN3BS (both of the Russian Federal Space Agency), will begin their voyage home to Earth this weekend, marking the end of Expedition 32 on the International Space Station. The trio will undock their Soyuz TMA-04M spacecraft on Sunday, September 16 at 7:09 PM EDT (2309 UTC) for the flight home. They are scheduled to arrive in Kazakhstan at the Baikonur Cosmodrome almost four hours later at 10:53 PM EDT (0253 UTC on Monday, September 17). NASA will televise the farewell ceremony, as well as the undocking of the Soyuz craft, its launch and landing in Kazakhstan live on NASA TV. Read more here. This weekend, 12 newly elected or appointed Section Managers will be in Newington at ARRL Headquarters for an orientation workshop. The primary purposes of the three-day workshop sessions are to share ideas and to provide basic administrative, management, leadership and motivational training. The workshop provides an opportunity for the Section Managers to chat among themselves or within the group, and to share their views on various issues and exchange ideas. Through training and orientation sessions conducted by ARRL staff members -- and by meeting with other Section Managers -- participants can explore what works, as well as what does not, and bring home some fresh ideas and some encouragement. Read more here. ARRL Book Editor Becky Schoenfeld, W1BXY, has been promoted to QST Managing Editor, the position formerly held by Joel Kleinman, N1BKE (SK). A Connecticut native, Schoenfeld has more than two decades of publishing experience. Prior to her employment at ARRL Headquarters, she was Senior Editor at Teaching K-8 magazine, one of the most popular magazines for childhood educators, and Senior Project Editor for textbook publisher Macmillan/McGraw-Hill. In addition, she founded Amaranth magazine, a successful poetry journal. She holds an MFA from Emerson College and a BA from Fairfield University. Her Amateur Radio activities include chasing grid squares in pursuit of her 6 meter VUCC award and DX hunting on 10 meters. The Sun, as seen on Thursday, September 13, 2012 from NASA's SOHO Extreme Ultraviolet Imaging Telescope. This MDI (Michelson Doppler Imager) image was taken in the continuum near the Ni I 6768 Angstrom line. The most prominent features are the sunspots. This is very much how the Sun looks in the visible range of the spectrum. 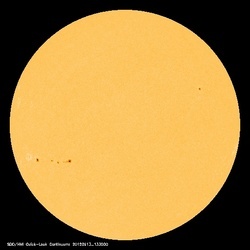 Tad "You'll find us chasing the Sun" Cook, K7RA, reports: Solar activity retreated this week, with the average daily sunspot numbers off nearly 46 points -- about 35 percent -- to 83.1, while the average daily solar flux declined 18 points to 118.9. Geomagnetic conditions were quieter, with the planetary and mid-latitude A index most days in the single digits; the average planetary A index declined from 14.1 to 6.6. The predicted daily solar flux is 100 on September 13, 95 on September 14-16, 100 again on September 17-18, 105 on September 19, 95 on September 20-21, 100 on September 22, 110 on September 23-24, 115, 125 and 130 on September 25-27, and peaking at 140 on September 28-October 1. The predicted planetary A index on September 13-17 is 5, 7, 10, 12 and 8, then down to 5 on September 18-19, 10 on September 20, 8 on September 21-23, 5 on September 24-28, 10 on September 29, and back down to 5 on September 30-October 2. Look for more on the ARRL website on Friday, September 14. For more information concerning radio propagation, visit the ARRL Technical Information Service Propagation page. This week's "Tad Cookism" is brought to you by The Wanted's Chasing the Sun. Next month -- October 1-5 -- the ARRL will welcome eight international students who want to learn how to administer and regulate Amateur Radio programs in their home countries. This course, offered by the United States Telecommunications Training Institute for learners from developing countries, will help the participants create, administer and foster an Amateur Radio Service in their countries. ARRL staff instructors will help course participants discover the ever-expanding universe of Amateur Radio communication, explaining why Amateur Radio operators -- upwards of three million individuals in virtually every country of the world -- have earned licenses to operate stations in the Service and why they are recognized, both by their governments and internationally, as a valuable voluntary telecommunications resource. Course participants will also discover how a telecommunications administration can bring the benefits of a healthy Amateur Service to its nation. Now in its 30th year, USTTI is a nonprofit venture involving leading US-based communications and information technology corporations and leaders of the federal government cooperating to provide tuition-free management, policy and technical training for talented professionals from the developing world. This is the 28th year that the ARRL has participated in the program.